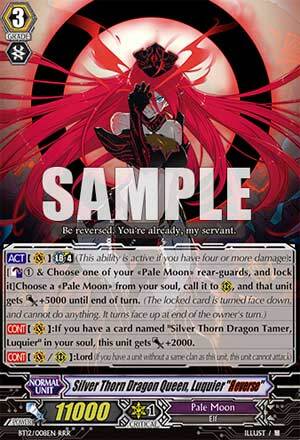 [CONT](VC): If you have a card named "Silver Thorn Dragon Tamer, Luquier" in your soul, this unit gets [Power]+2000. ...Luquier is the prime definition of what a Reverse Unit should be! A solid 11,000 Power? Check. A good unit to Crossride with? Check. A Legion that can easily support the Reverse Unit? Check. A Limit Break that can change the flow of the game if done correctly? Check. ...but before we get too ahead of ourselves here, let's elaborate. Luquier "Яeverse"'s Limit Break is Counterblast 1 and Lock 1 of your units (doesn't has to be a Legion) to call a Pale Moon from your Soul to the field with an extra 5,000 Power Boost. That boost compensates the Locked unit as you would normally Lock a pointless booster, and the fact that it doesn't make you use your hand to use the Limit Break, it preserves any future turns you would need to guard while still giving yourself the field presence you need to overwhelm your opponent, and combining this with Purple Trapezist makes it so that you are able to modify your field to your heart's content until you get the ideal setup that you're looking for. Overall, Luquier "Яeverse" was the only Reverse Unit that was able to stand their own against the likes of Link Joker and Revengers in Japan for a reason, and a Reverse Unit like this that is able to synchronize with the Clan so easily makes her a real threat when she hits the field. Next Time: ...! What just happened to me? ...what's with the backwards R's??? Closing up the week is quite honestly the most insulting thing to intelligence I've seen, Luquier "Reverse". Late Game, Counterblast 1, lock one of your rear-guards, call a Pale Moon from the soul to an open RG circle, and it gains 5k until the end of the turn. This, I think, is the perfect opportunity to get some much needed myth-busting out of my system. Many people jumped on this because ERMAGUD +1. Except it really isn't a +1. Think about the card in terms of context. How are you meant to achieve a +1 if you've locked one of your own units, killing off its capacity to hit for normal columns? You're pretty screwed if whatever you call from the skill can't hit the Vanguard for 10k guard (which means against a Crossride absolutely goddamn nothing CAN). What's worse is that it requires an open RG space. So even in the most optimal scenario, you've basically got to accept whatever you call will receive no boost. Unless you want the Vanguard to have no threat for that turn. And of course, it's a Limit Break. That RUINS the skill entirely because all you've managed to achieve is a de-screw, and even then, not a very good one. It's got the same problems as the old Luquier; the more you can call, the more it means that you've fallen behind owing to lack of calling from the hand and losing pressure. It's just an anti-retire strategy but that's all it's really good for. It would be better but still manageable if it wasn't reduced to a time when its skill matters least because then you could set your field up for Late Game push. Sorry, pal. The End still reigns supreme to me, you horrible, horrible trash card. What happens when a blue haired girl goes gaga for one of the protagonists and gets reversed? We get Silver Thorn Dragon Queen, Luquier Я. I won’t go into great detail about her but she can use her counterblast, if you have the damage and rear guard units to lock up to 5 times. That’s +25000. If your opponent has no hand or interceptors, that’s kinda scary. As with all Яeversed units she gets power if her original self is in the soul. Not a fan of power for the sake of power.